It’s summer, the season of road trips… and for a lot of us, our best friend (of the furry, wagging variety) is likely to be coming along for the ride—now, and all year round. Cars are designed with an incredible level of detail when it comes to human passenger protection, but without so much thought devoted to canine safety. 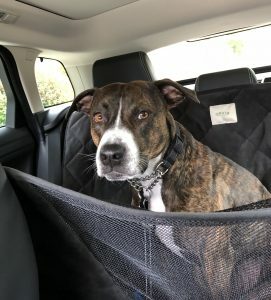 What sorts of things can you do to keep your doggo safe and comfortable in the car? There are more options than you might think. 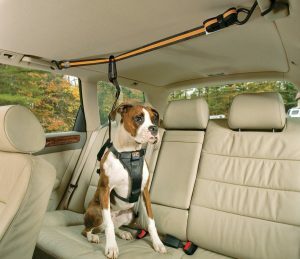 Here are some of the best dog car safety products and practices. But regardless of what state you’re in, it’s dangerous for your dog if they’re riding around without some sort of restraint. It can be even more dangerous for you. Why? Inertia. An object in motion tends to stay in motion. Even if we didn’t take physics, most of us remember hearing that somewhere. (Something about an apple…) So if your car stops suddenly, as in a crash, everything in it that isn’t fastened down in some way—whether it’s a tissue box or your canine copilot—keeps going at the same rate of speed it was previously traveling. Even 25 miles per hour times your 40 pound dog’s weight means she becomes a 1000-pound projectile. Obviously, that doesn’t end well for her, or anyone sitting in the seat in front of her. This is basically a dog seatbelt. There are a lot of different styles, and a lot of them can double as a walking harness—which is a nice alternative to a collar for some dogs who tend to pull a lot when walking, or are older and could benefit from less pressure on their neck. A few good options are made by Kurgo (the “zipline” design gives your dog freedom to move around the back seat), ZuGoPet Rocketeer (if your dog’s under 25 pounds), and the fashion-forward Sleepypod Clickit Sport. They all are designed to basically tether your dog to your car’s seat belt system, and keep them secure during sudden braking or a crash. If you have an SUV or hatchback with an open cargo area behind the backseat, a crate can be a good solution. They’re of course also useful if you need to keep your dog restrained at times when you get to where you’re going, like a hotel, or if they’re crate trained and are most comfortable sleeping in their crate. It’s not quite what it sounds like… but similar. It’s a large piece of canvas or other durable material (usually with a nice soft lining on the side that will face your dog) that fastens to your front and rear headrests and covers your backseat and the footwells that your dog could fall into. It’s not as secure as a harness, and it doesn’t protect the dog or the front seat passenger if they go flying into the back of it. But it does provide a barrier for the space between the front seats, and a little more stability for your pup when they’re in the back. Some of our favorite dog hammocks are made by Orvis, AmazonBasics, and PetEgo. Whatever you do, please don’t let your dog, no matter how big or small, ride on your lap. There’s just too much risk of driving interference, and it’s a huge risk for everyone involved. You can cuddle when you get to where you’re going. It’s also a good idea to always remember to bring a leash. Even if your dog isn’t typically on one, there are a lot of places you may go where it might be a requirement. And, it’s just always a good idea to have one in case of an emergency. A major part of any road trip is, of course, the snacks. Your dog, if she’s anything like mine, agrees. Bring some of your dog’s favorite snacks, and also plenty of food and water—just in case you get stuck somewhere! 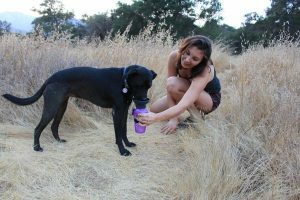 You have a travel mug for coffee, and now your dog can have one for water… the AutoDogMug is easy to fill with one hand, and fits in a cup holder. Because some dogs prefer a more traditional bowl, the Lixit water bowl is closer to that, and also spill-proof. For both food and water, we like the packable, closeable Ruffwear Quencher Cinch Top bowl. Beyond the essentials for safety and survival, there are a lot of more general items you should bring along. Bags for picking up after your dog, eye protection if you’ll be participating in action sports together, protective footwear if you’ll be covering hot or jagged terrain. And toys! Don’t forget a toy or two for keeping your best friend occupied while riding in the car, as well as something to play with at rest stops!